Internet users say that one of the most important aspects of online health advice is the fact that it’s available at any hour of the day or night, from wherever they are able to log on. Fully 93% of those who have gotten health information say that convenience is important. Internet users also like to search a diverse menu of resources – from commercial sites like Drkoop.com to government sites like the federal National Institutes of Health (www.nih.gov). Eighty-three percent of those who have sought health information say it is important that Internet users can get more health information online than from other sources. Anonymity is also important to Internet users – the search for health information can be conducted without encountering anyone else. Nobody has to know about that bout with depression or an incontinence problem. 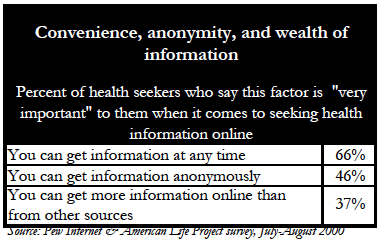 Eighty percent of health seekers say it’s important that Internet users can get health information anonymously. All these attributes of the Web are especially attractive to women, to parents who have children under 18 at home, and to minorities. And it is easy to speculate why. In addition to being concerned about their own health, many women are also gatekeepers and advocates for the health of those they love. Women, in general, and mothers, in particular, are also among the most stressed for time, so the convenience of looking up health information on the Web is appealing to them. For African-Americans and Hispanics, the Web’s appeal might lie in the fact that it is especially empowering to them when they can get information to supplement information from sources such as doctors, clinics, or hospitals. Hospitals, pharmacists, insurance companies, and patients are struggling with the murky issues of medical privacy. Internet users have made it clear that privacy is one of their primary concerns – whether it’s their name and address being sold to a marketer or their medical records being handed over to researchers or broken into by crackers (that is, hackers with destructive or illegal intent). Everyone involved with online health care is waiting for new privacy rules that are expected to be released in the next few weeks by the Clinton administration’s Department of Health and Human Services (HHS). There is little legal protection now for health information – online or offline. Unlike financial records, credit reports, and even video rental records, there is no comprehensive federal law that protects the privacy of medical records. State laws are generally considered inadequate for the rapidly changing health care delivery system. That is why Congress specified in the 1996 Health Insurance Portability and Accountability Act that federal rules should be written by HHS in 1999 if Congress itself had not written such rules. The department released draft regulations in November 1999, and received more than 55,000 comments on the draft. It appears unlikely that the new rules will have a major impact on health Web sites or give significant privacy protections to those who use those Web sites. The regulations may impose some confidentiality standards on certain Web sites and provide new protections for the consumers who frequent such sites. But the regulation will only cover three kinds of health care entities, all of which are related to insurance activities. They will cover providers who electronically transmit insurance claims information, insurers, and the “clearinghouses” that process information for providers and insurers. The draft regulation only covers a select universe of information held by these three entities. Given the wide range of activities that take place on the more than 17,000 health-related Web sites, and the relatively narrow scope of the regulation, it is likely that a great deal of health information collected on health Web sites will not be covered by the new regulation. Many of those Web sites do not fall into any of the categories of organizations covered by the new rules. Internet users will appreciate whatever privacy protections they get, and they appear eager to get as many safeguards as possible. Most Internet users are anxious about their privacy online and this general feeling becomes quite acute when it comes to medical and health information. An overwhelming majority of Internet users and an even greater 89% of health seekers are concerned that a health Web site might sell or give away information about what they did online. Most health seekers fear reprisals might occur if others knew the kind of information they were examining at health Web sites. Eighty-five percent of health seekers are concerned that an insurance company might raise their rates or deny coverage because of the health sites they have gone to online. In a similar vein, Internet users are afraid that their online health research could have an impact on their job status. More than half of health seekers (52%) are concerned that their employer might find out what health sites they have gone to online. Interestingly, this question elicited the highest level of “not at all concerned” responses in the overall Internet population – 35% – possibly because not all respondents are employed, possibly because these Internet users do not believe their employers will track their online health research. This relatively high level of confidence may also be explained by the fact that most Internet users go online from home when they get for health care information. African-Americans, Internet newcomers (those who have been online for 6 months or less), and parents with children under 18 showed the highest levels of privacy concerns. One of the hottest topics among doctors, legislators, and health Web site business leaders is the act of putting medical records online. The American Medical Association not only endorses online technology, but also has helped found Medem, a for-profit technology company that creates Web sites for doctors and would allow for secure communications between patients and offices. Many argue that the ready availability of a patient’s comprehensive medical history would save lives, reduce life-threatening medical errors, and improve the communication between doctors and patients, and doctors and their colleagues. Mark Leavitt, chairman of MedicaLogic/Medscape, Inc., testified before Congress in June 2000 and compared the convenience of online medical records to ATM machines and called on legislators to aid in the fight against the “national problem” of medical errors. But is the public ready for this step? A majority of Internet users (60%) think that putting medical records online is a bad thing, even if they are on a secure, password-protected site, because they would worry about other people seeing their personal information; 33% think it’s a good thing because they would have easy access to their own medical records. Some 63% of health seekers believe that putting medical records online is more a threat to privacy that it is a benefit. 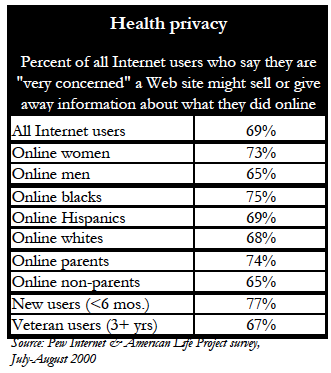 Women, older Internet users, and Internet novices are the most wary of online access to medical records. Sixty-five percent of online women say they would worry about other people seeing their health records, compared to 55% of online men. Sixty-five percent of Internet users between 30-49 years old are opposed to online medical records, compared to 50% of those between 18-29 years old. Fully 74% of Internet users with less than six months of online experience are fearful of online records, compared to 58% of Internet users with three or more years of online experience. Men, young people, and more experienced Internet users are the most likely to say online medical records are a “good thing.” Thirty-seven percent of online men see the benefits, compared to 30% of online women. Forty-three percent of Internet users between 18-29 years old say online access would be good, compared to 32% of those between 50-64 years old. Thirty-six percent of those who have been online for three or more years see the advantages of online medical records, compared to 19% of the newest users (less than six months experience).